The MMA fighting expert gave M&F the lowdown on McGregor's training. M&F: What was your first impression of Conor? Owen Roddy: When he came into the gym and onto the Irish team, we were all mainly grapplers with a bit of striking. There’s nobody that was a very powerful striker. When Conor came in I knew he had unbelievable power and very good timing, and then from very early on I knew he had something special. He was always very confident from Day 1. He hasn’t really changed in that regard. People think he puts on a persona for the TV, but he was always 100% [genuine]. He always had that belief in himself. So those two things set him up to have the potential to be one of the greats. Conor’s been fighting for 10 years. How much longer does he have left? I always say this: It’s not about how many years, it’s about how many times that chin has been touched. I can count on my hand how many times Conor has been hit clean on the chin. It’s very, very little. He hasn’t taken any damage realistically. He took some damage in the Diaz fights. Other than that his chin is perfect. If he keeps doing what he’s done for the past 10 or 12 years, he could fight until he’s 40. How often does Conor spend working on strikes? When we’re in camp it’s almost every single day, a half an hour straight just working on refining strikes. Everybody knows it’s the left hand, his uppercut. He lands his shots over and over and over and over again. It was a Bruce Lee saying: Fear not the man who has practiced 10,000 kicks once, but fear the man who has practiced one kick 10,000 times. Conor has his set shots that he lands on everybody and that’s because we spend a lot of time refining those. Who are some other great strikers? Everybody at SBG [Straight Blast Gym] has fantastic striking, although they don’t get the knockouts that Conor seems to get. They’re all different in regards to how they move. If you look at Artem Lobov, he moves completely different from Conor, but it works for him. And he also has amazing knockout power. They’re all doing fantastic, but Conor, he’s a step above everyone else. Speaking of wrestling, how would Conor do in WWE? Don’t be surprised if you see him in WWE down the line putting shots on people. He’s got the mic skills. He would definitely be a super villain in WWE. I think it’d be great, it would be a spectacle. Ronda [Rousey] has done it, Mayweather has done it; a lot of celebrities do it. I could see him going in as a general manager or that sort of a plot line and taking over the whole thing; it would be great to watch. He’s got some of the best feet in the game. You can’t really see it because it’s so subtle. He always maintains his lanes perfectly at all times. Floyd Mayweather is the best at maintaining his range and just staying fluid and making people fall into his shot. Conor’s so good at that. When it comes to landing the strikes, his feet position is on par with the best in the world in boxing; possibly one of the best, if not the best in MMA. Why does every boxer and fighter jump rope? Skipping is fantastic. It gets your coordination up, it gets your timing up, and it gets you light on your feet. In order to be able to move quickly and stable you have to be able to transfer your weight evenly and you have to be able to do it very quickly and in the blink of an eye. People don’t realize how important it is. Distance is key in terms of striking, but if you can’t reach your opponent you can’t really hit them. How do you teach keeping the proper distance? It’s years and years of training. For the new guys coming in we’ll get them to fire at arms length and stay at arms length and just at the edge of range. Just moving your head around in there because when you play with that edge of range, if your opponent throws at you and you slip his shot, they then will pull down an inch forward. When they get pulled an inch forward, realistically, they’re going to get pulled into your range and then can fire off. It just takes years and years of timing and knowing exactly where your range is. In regards to your opponent, if guys are your same height, you know the range and distance. If you’re fighting a taller guy your range is a bit farther out and then when you get them to throw those shots you gotta be able to make a miss and close at the same time. 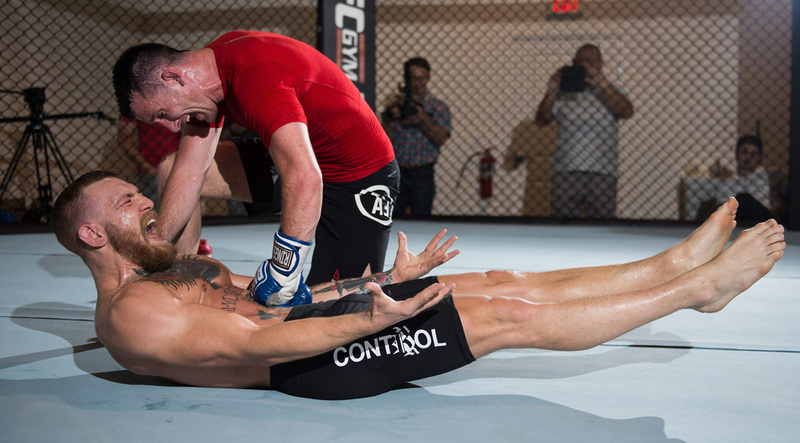 How has Conor’s training changed since you’ve been working with him? Since we started he had a bit of boxing but he had the same power. He was easily taken down, he was easily submitted. When I say easily submitted, he was a bit of a quick, scrambly guy. He resisted everything to look as great but he had no skill set on the ground. He’s open-minded, he realized where his holes were and he started to learn how to kick, started to learn how to stand the takedown, started to enjoy jiu-jitsu. I forced him to take jiu-jitsu, he had to do it. Maybe six to seven years ago, he started to enjoy jiu-jitsu. He put the gi on, and he started to enjoy it. Are you still focusing on that? Oh, we’ve done everything. There’s always room to improve. We’re always trying to add new skills. When it comes to fight camp, then it’s strike down the opponents and put the shot in that we can land on him.